Chinese asters (Callistephus chinensis - Tall Paeony, Duchess Asters) come in great mix of colours! There is yellow, scarlet, apricot, dark blue, pink, magenta, and more. Duchess Asters have huge, double blooms with incurved petals that grow on tall, upright plants with 5 to 8 floral stems. Aster Callistephus is an excellent cut flower and has a long vase-life. Their flowers are similar to autumn chrysanthemums, but they bloom so much earlier in the season. Asters grow quickly and bloom heavily. Start the Aster seeds in the spring 6 to 8 weeks before the end of frost season. The flower seeds are small, so press them into the soil gently and lightly cover them. Harden the Aster plants off for 10 to 14 days before transplanting outdoors in a sunny to part sun position. I love asters, but here they mean end of summer and early autumn. Beautiful asters. Thanks for hosting. 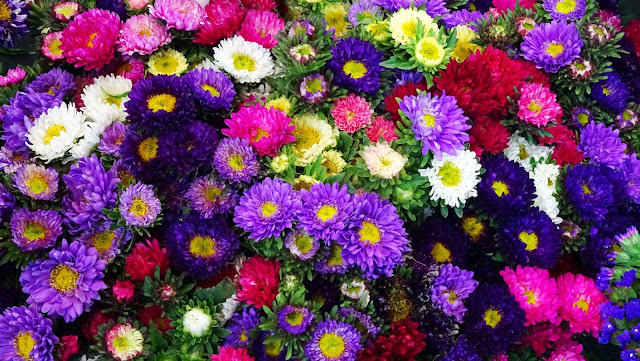 I really like all the different colours you can get in asters. They look so happy when they are all mixed like that.